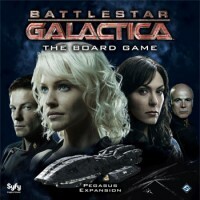 Pegasus is the first expansion for Battlestar Galactica, covering the second season of the TV show. In true Fantasy Flight tradition, the expansion isn’t just content to add more of what’s already there — skill cards, quorum cards, characters, Crises — but to introduce a slew of entirely new mechanics into the mix. Some of these new mechanics work better than others, but luckily they needn’t all be used together. The Pegasus expansion adds the titular Battlestar Pegasus, another ship in the human fleet with location abilities that are more powerful and more risky than those on Galactica or Colonial One in the base game, Cylon Leaders, a new character type who start the game as Cylons but whose true loyalties are always in doubt; Treachery skill cards, which subtract from almost all skill checks and have abilities only usable by Cylon players; Reckless skill cards, which grant benefits to skill checks but trigger detrimental effects from Treachery skill cards played into them; and the New Caprica phase, and endgame replacing the Kobol destination where the human players survive Cylon occupation and oppression until they can make their escape. New skill and Quorum cards provide more variety and options to all players, as well as making things more unpredictable, and the new Crises fit in with the base game’s very smoothly. The Battlestar Pegasus adds interesting options with its increased risk-vs-reward abilities. Pegasus CIC and Main Batteries can do more damage to attacking Cylons than Weapons Control, but can also hurt the humans on a bad roll, and killing a suspected Cylon with the Airlock is a much more decisive solution than sending them to the Brig, but the consequences of getting a human by mistake are worse. Treachery skill cards can give revealed Cylons a couple more options to use on their turn, but most of them only trigger when played into a Reckless skill check, and revealed Cylons don’t have a way of making skill checks Reckless; human players just tend not to use Reckless abilities once the Cylons players are known, and unrevealed Cylons have few ways of getting Treachery and fewer ways of using the ones they get without tipping their hands. Treachery’s still a worthwhile addition to the game, but it doesn’t quite accomplish what it sets out to do. Players also have the option of starting as one of three Cylon Leaders, with their own special rules. Instead of a Loyalty card, Cylon Leaders get an Agenda, which is Sympathetic or Hostile depending on the number of players in the game. Cylon Leaders can switch between being a Cylon player and “Infiltrating” as a human player at will, and their Agenda card describes specific conditions required for them to win: one may want to salvage Galactica and thus want the humans to lose, but Galactica to be only lightly damaged when they do, another may want humanity to prove its worth, and thus want the humans to win, but only after having lost a great deal of ships or resources. Each agenda is supposed to require the Cylon Leader to help both sides, meaning neither side is quite sure who they work for — is Leoben helping the fleet survive because he wants them to win, or because he wants them to have their hopes crushed at distance 7? Is Six sending raiders at us to test us or to kill us? Unfortunately, some of the Agendas are much worse than others, and there are few enough Agenda cards (6 in each deck, 4 pro-human in Sympathetic and 4 pro-Cylon in Hostile) that the bad ones can’t really be taken out without throwing off the proportions. Testing the humans’ worth requires the Cylon Leader to play both sides, but “Join The Colonials” just requires them to be in the human fleet at game’s end… so how are they different from a human player? The most lackluster addition has to be the New Caprica segment. It replaces the last jump cycle of the game, beginning when the human fleet reaches distance 7, and has the humans surviving on Cylon-occupied New Caprica long enough for Galactica to return to orbit, get all the civilian ships out of impound, and jump the **** out of there. It has new rules, new Cylon forces, a new board, and a separate Crisis deck, but mostly just drags the game’s length out. It can be cool to play once or twice, but most groups just go back to using the Kobol objective. So, Pegasus isn’t perfect, and some of its more ambitious new developments can have some heavy flaws. Wisely, the expansion is structured such that you don’t have to use all of the new additions, and you can just add the parts that work and leave the parts that don’t, usually New Caprica, in the box. Overall, the expansion is definitely worth your time, providing new options to explore and new abilities to become a welcome part of the “core” gameplay, and then a couple new gimmicks on top of that you can try once or twice and then leave behind. Give me Helen Tigh any day of the week. NO, I didn’t mean in bed, I meant to play at the table. I feel the same way about most of the other aspects of the expansion. Who doesn’t want a powerful but dangerous ship in the Pegasus? Who doesn’t want Plastic Base Stars? Yep, that is a sell right there. You’ve now got the powerful Battlestar Pegasus to add into the ship mix. The contingent of new characters are all exciting to try out with game changing abilities and interesting flaws. Now, the cylons are given objective cards to show them their win conditions. Sometimes they even help the humans in order to win. One of the best elements of the expansion is the way in which the sympathizer card has changed. You get to chuck the old card out the window. There are rules for cylons to infiltrate the fleet now and for cylon leaders to start the game off on the other side. The New Caprica objective is a tough objective to complete, but it feels great as the humans when you succeed. There is a also a new skill deck called Treachery which is almost always negative for the humans and for skill checks. This expansion increases the replay value of the original game incredibly. The rules are very modular so you can take what you like and keep out what you don’t like a good host of a party keeping out the creeps and throwing in some babes or booze. There is lots of components to experiment with in various combinations. The components are all of the usual quality from Fantasy Flight Games . There is one thing that gives this expansion a 5/5 from me. Plastic 3-D Base Stars! Those things are much more intimidating, better to look at, and easier to pick up off of the board when you narrowly escape or blow one of those suckers out of the sky. The rules for this expansion are as complicated as the original game, but add more moving parts and stages to the game. The first time that you try to play with New Caprica instead of Kobol, people will be confused, there is no doubt about that. It might be wise to add in all the other components of the expansion first before introducing the New Caprica Objective. 3-6 players This game is more fun the more players you’ve got. If you want a more confrontational game with less intrigue, you could always play 3 players with a Cylon leader. I really haven’t tried it, but it would be a different type of experience. 10+ age I can’t suggest this game for a younger crowd unless they are sharp as a fresh set of kitchen knives. 120+ minutes The full expansion with New Caprica extends the playing time of the game by at least an hour, especially the first one or two play throughs. The Pegasus expansion definitely adds some keepers to the game. I wouldn’t say that it is absolutely necessary with the base game. In fact, I had some friends that said they would rather just play with the original. The exception for everyone though, was the new characters. Everyone enjoyed them, except for Duala . She is also less powerful once you add the Exodus Expansion (but that is for another review). If you are a collector, you should definitely pick this up. If you play BSG a lot, you should pick this up. If you only play a couple times a year or less, this may not be for you. If you don’t get it though, you’ll have cardboard Basestars. Or are they? It’s hard to know in this expansion. You may now play as a Cylon Leader character. That player is given a hidden agenda card, and that card might be beneficial for humans or not. It’s hard to tell. Depending on the number of player, the chances of getting a pro-human card varies. So don’t execute the player yet, it might be bad for you. So you now have a Cylon amongst you, and you all know who it is. But that player is able to walk around on Galactica and Pegasus – the new ship in this game. Limited in cards to play, but helpful in other ways. But how can the player win? Example: if 6 or more vipers are damaged or destroyed, and the humans wins. Then the cylon player also wins. So the player has to make sure something bad happens, just to spread enough discontent and uncertainty. New Caprica is also added. It’s a game changer, and I find it quite the anti-climax. Once you’ve reached a destination of 7, you reach New Caprica. Here, you’ll settle and be occupied by Cylon forces. While waiting for Galactica to return, you try to free up civilian ships and sabotage Cylons. Suddenly everything is narrowed down to tiny actions, and I never felt this module does anything good. I don’t play with it. And also: plastic basestar models! Finally. I never understood why we got fantastic Vipers and Raptor models, and only cardboard basestars. In total, you should definitely get this expansion for the Cylon Leader option and plastic models. It’s not the best expansion of the two, but it’s great! Battlestar Galactica is one of my favorite board games, and absolutely my favorite cooperative game. With plenty of material to draw from the television show, an expansion was almost inevitable. Pegasus draws from the second(ish) season of BSG and adds several new modular components to the base game. Several new characters are added to the game, including Cylon Leaders, who are known to the entire group as Cylons but who have a hidden agenda which may or may not be beneficial to the humans, so their motives are still unclear. One of the key additions to the game is the Battlestar Pegasus, a side board that has new locations for the crew to use. It grants some amazing powers like being able to execute a suspected Cylon rather than just throwing him in the Brig, or to ensure that the jump track continues to advance. However, the cost for these is also high, and while we nearly always play with Pegasus, we also nearly always use her as a shield against damage to Galactica. Another big addition is a new final objective: New Caprica. Near the end of the game, a new side board comes into play in place of the Galactica locations. The goals change slightly as well: the humans now have a stack of civilian ships to prep and launch before they are destroyed, and the Cylons have some powerful tools to stall their progress. We have found this objective adds a level of complexity that stifles the gameplay and adds an hour to play time, and so we almost never play this objective. All in all, this expansion has a lot of great new options added to an already-great game, and the fact that they are modular keeps things very flexible in terms of what your particular group may or may not like combined with the base game. If your group loves BSG, make sure to pick this up. The Pegasus board plays well with the original expansion and fits well with the other expansion Pegasus, in fact I feel its a need with the Cylon Fleet board interactions dropping a large amount raiders on the board more rapidly than you can sometimes grasp and the guns are a welcome addition, also the air lock can be fun if you can pinpoint the Cylon or blame a human as being a Cylon when you are a Cylon. The New Caprica board was played once by my group and it just didn’t seem to take, they understood it well enough, but the humans have a hard enough time winning in our sessions so why drag it out? Add a Review for "Battlestar Galactica: Pegasus Expansion"